A product launch event that holds the audience’s attention while introducing five dissimilar products in one evening, each one aimed at a slightly different market segment. Familia Sanchela’s special events producer Juan Pablo Niera turned to Gary Jesch of CHOPS and his interactive avatars because even large-screen pre-recorded videos wouldn’t be able to reveal the excitement, passion and nuances of the product line, without risking some disconnect by an audience that was anxiously waiting for the dinner and drinks. Juan Pablo Neira had his set designer and AV team put together five distinct stages with backdrops and screens, and then routed the output of the CHOPS system so that Gary could switch from one screen to the next, on cue. Jesch’s script of the event indicated which character went with which script, and used characters to fit the products. For example, the Baby G character spoke about diapers, followed by the teen daughter speaking about feminine hygiene products. Between each presentation, the presentation went back to the VirtuaLibby character as part of the show flow. The virtual characters captivated the audience’s attention in interactions with the hostess in real time. Our Colombian producer came up with an original concept for his client’s product launch, using five of our characters, one at a time, in the same show, on five different stages. The result: attendees to the party couldn’t quit talking about it. Behind the scenes, Gary worked with the production’s actors and comedians to prepare each of them for their part in the show. Gary and I created more than a dozen product launches and special events in Colombia over a three-year period, from Bogota to Cartagena. We amazed US ad agencies who thought that Colombia was going to be behind the times. Gary had to travel for 24 hours by plane each direction and never missed a schedule. He’s certainly an unforgettable character himself. 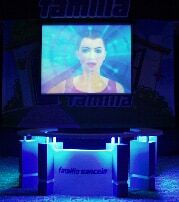 For the first time ever, five virtual characters were used in one show, at a corporate product launch in Colombia. Special event producer Juan Pablo Neira of Live Marketing Colombia told his client, Familia Sancela, that this special presentation would make it easier for them to introduce a new line of paper products to purchasing agents and distributors. CHOPS & Assoc. 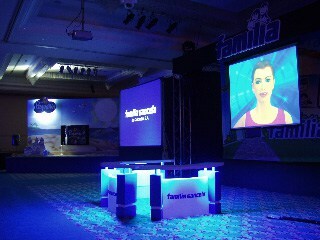 Live Animation supplied the characters for the show from its “family” of characters developed over the years for tradeshows and special events. Pioneer performance animation artist Gary Jesch brought his Digital Puppeteer real-time animation system to Cartagena, Colombia, to work in the Cartagena Hilton Ball Room for the special night, which also included a multimedia show, plus presentations by comedians and a cocktail party. The room was prepared with five stages, each with rear projection systems and round screens, one for each product. Adult diapers, industrial paper for restrooms, women’s hygiene products and baby diapers were introduced by the characters – not exactly easy or exciting subjects to describe. Each virtual character would interact with a corporate marketing executive who was responsible for that product line, describing the benefits and quality for the audience. Then, a real actor would take the stage to do a five-minute comedy routine. Unknown to the audience, some of these same comedians were also the voices of the virtual characters in the show. Neira and Jesch selected four actors (two of these had worked as virtual character performers in Colombia on past occasions), and Neira also performed as a character in the show himself. During each ten-minute presentation by a virtual character, Jesch sat alongside the performer backstage and operated his Digital Puppeteer system. Then he prepared for the next actor in the show, applying the Face Tracker markers and conversing with the director via intercom. At one point, while Baby G was presenting, a computer running a Powerpoint presentation hung up, forcing the actor and the executive to ad-lib, until the technicians could get it running again. But the actor saved the night with his performance and funny lines, falling back on the talents he developed as a professional actor on soap operas in Bogota, as well as his stand-up comedian experience. The audience was nearly in tears by the time the slide show came back on. Aside from the flub in the slide show, the night went perfectly and the audience never knew anything went wrong, Neira said. “It was pretty easy to stage, considering, and our team did everything right to make it work perfectly.” The AV company, Eleven Produciones, supplied the video routing and projection systems. Jesch and the actors rehearsed the entire show with the corporate executives once, the day of the show. For Jesch, it was just as easy to travel to South America with five virtual characters as with one. “I have designed a road system that can come with me as checked baggage into foreign countries, making travel and customs much, much easier.” He has worked over a dozen times with Neira in Colombia and Mexico, and has traveled with his system to China and other countries since it was built in 1996. “I just wish all my characters could accumulate frequent fliermiles as well,” he said. The “family” of characters includes representatives from all ages: Brash Landau (father), VirtuaLibby (mother), Cytina/Cybrina (daughter), Virtual Vinnie (son) and Baby G (baby son). In Familia Sancela’s show, Brash was the spokesperson for the adult diapers, VirtuaLibby was the main hostess and MC, Virtual Vinnie spoke about industrial/commerical paper towels and products, Cytina introduced a new line of feminine hygiene products and Baby G told the audience how he slept better at night with Familia’s nighttime diapers. For shows in the United States where several characters are used, Jesch can now supply multiple animation systems, so the audience can see the characters interacting with each other and with the audience in real time.